Hoary Headed Grebe (Poliocephalus poliocephalus). Do you like my tail feathers? 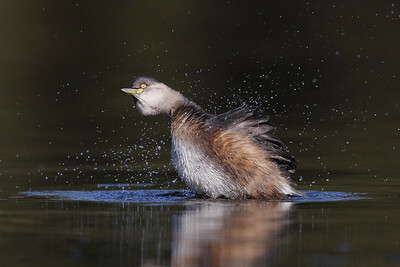 Australasian Grebe (Tachybaptus novaehollandiae) preening, or is perhaps showing off. Male Hardhead Duck (Aythya australis) with a feather for hitchhiker. Black Swan (Cygnus atratus) in flight. Australasian Grebe (Tachybaptus novaehollandiae) adult. 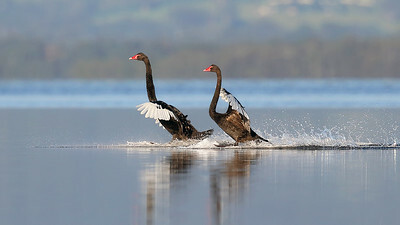 Black Swans (Cygnus atratus) adults just doing a bit of water skiing. Australasian Grebe (Tachybaptus novaehollandiae) non-breeding drying off. Australasian Grebe (Tachybaptus novaehollandiae) about to eat a fly. Grey Teal (Anas gracilis) having a snip of water as the sun rose. Australasian Grebe (Tachybaptus novaehollandiae) adult preening.